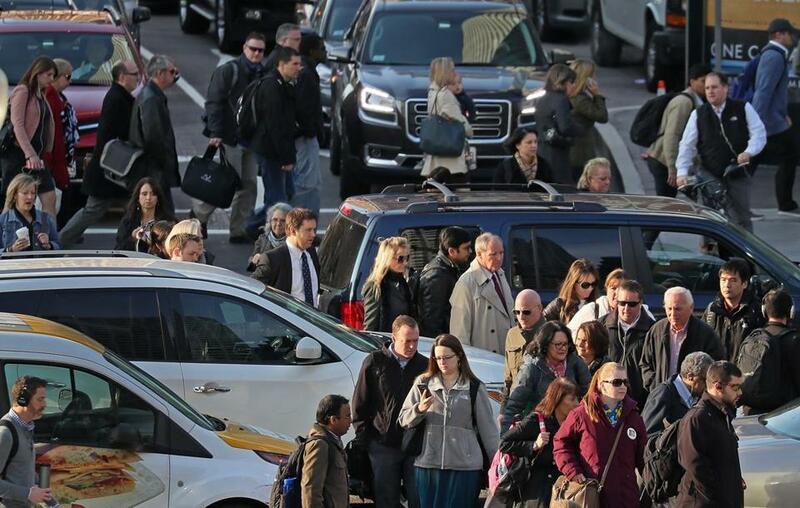 Cars blocked an intersection during the the morning rush hour in Boston. If you’re driving in a crowded city, it’s your job not to hit anybody. Not cyclists, not pedestrians, not even pedestrians wearing headphones. The problem isn’t that Walsh thinks pedestrians and cyclists should pay attention to their surroundings. (Shouldn’t everybody?) It’s that, in his comments, the mayor seemed to accept the myth of the beleaguered Boston driver who’s at the mercy of unpredictable bikers and walkers. When a car hits a bike in the Netherlands and some other countries, laws generally presume that the person driving the two- or three-ton metal box is responsible. Here in Boston, we’ve all internalized the idea that driving is how human beings naturally get around, and that everything else in city life — our transportation plans, our development rules, our circadian rhythms — must bend to accommodate it. Even as alternative forms of transportation proliferate, and even amid a housing shortage and horrific rush-hour traffic, the city rezoned South Boston late last year to require two-thirds more off-street parking with new residential buildings. Developers Redgate Partners and Hilco Global are pushing nearly 1,000 new spots for cars at a mixed-use project there, and the public debate may turn on whether that’s too little parking — not too much. At times, we forget the precarious nature of our situations, me on my bicycle and you in a vehicle. Meanwhile in Charlestown, adding 2,000 private units to an existing public-housing complex is the only realistic way to pay for upgrades to existing below-market-rate apartments. But the One Charlestown project is controversial because of fears that, as one resident objected, the infusion of new people would make it harder to drive to the post office. Walsh’s comments on the radio Tuesday were jarring not least because, on other occasions, he’s taken a broader view of how urban transportation might work. The city has lowered its default speed limit from 30 miles per hour to 25. It’s embraced something called Vision Zero — the goal of eliminating all traffic fatalities in the city by 2030, partly by redesigning streets to make them safer for bicyclists and pedestrians. In practice, though, the city’s bicycle lanes are regularly blocked by delivery trucks, passenger vehicles, and even police cars. All too often, city government still sends this message: Real people use cars; all that other stuff — the bike lanes, the climate planning, the official paeans to transit-oriented development — is OK only if doesn’t bother drivers. Congested intersections are stressful places, and those of us who get around town through a combination of driving, walking, biking, and taking the T can toggle easily among different modes of indignation. While driving, I too have silently cursed jaywalkers whose flouting of “don’t walk” signals left me stranded at a red light. When stepping into crosswalks legally, I’ve been startled by cyclists who whizzed past when they should have stopped. Still, misdeeds by drivers carry far more risk. 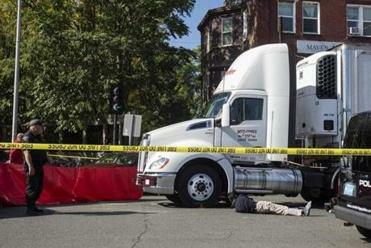 Y et drivers who kill or maim cyclists or pedestrians sometimes avoid even minor charges. It’s easy to blame crazy cyclists or headphoned jaywalkers for getting hit by cars, but the victims are often children and elderly people. Calls for personal responsibility also mask the underlying issue: Many streets and intersections in Boston aren’t properly designed for the mix of people using them. The other possibility is that, when throngs of transit commuters pour out of South Station every morning and jaywalk across the street, they’re sending a message of their own: We’re focusing too closely on the needs of motor vehicles, and not enough on all the people around them. Dante Ramos can be reached at dante.ramos@globe.com. Follow him on Facebook: facebook.com/danteramos or on Twitter: @danteramos.